Curating one of his first shows, a look at radical "Red Art" during the Great Depression sparked John Murphy's interest in making prints the focus of his career. "That was where I really became interested in prints as a form of almost political speech" and their use in satire and caricature, as well as a way to make art accessible to the masses, said Murphy, who joined USD last fall as the curatorial fellow for prints in the Robert and Karen Hoehn Family Galleries. Throughout history, prints created by transferring a design from a matrix like a woodblock or copper plate to a sheet of paper, allowing multiple copies to be made, have been a way for artists to truly express their opinions and make a living, without being beholden to a wealthy patron or the Church or state, Murphy explained. Prints, such as Shepard Fairey's images of Barack Obama, continue to be a way for artists to be subversive and challenge the status quo, he said. Murphy comes to USD from the renowned Art Institute of Chicago after earning a PhD from Northwestern University and a bachelor's degree from the University of Oregon. 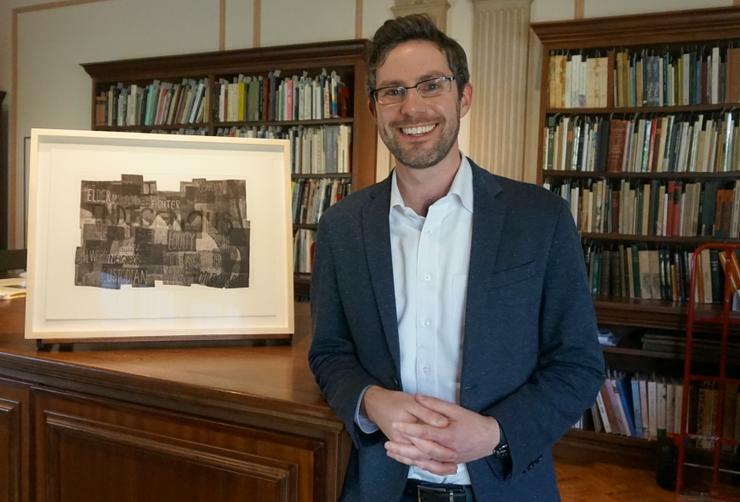 He succeeds former curatorial fellow Erin Sullivan Maynes who is now assistant curator for the Rifkind Center for German Expressionist Studies at the Los Angeles Museum of Art. With a particular interest in early to mid-20th century American, Latin American and African-American art, Murphy is looking to expand the Hoehn collection in those areas. Already, he has acquired a lithograph by legendary African-American artist Charles White, as well as one from White's former wife, artist Elizabeth Catlett. With USD's print collection continuing to expand, "this is a very exciting time" to join the Hoehn Galleries, added Murphy, who met recently with Native American artists in Portland with an eye toward acquisitions tying the Hoehn Galleries to USD's David W. May American Indian Collection. Along with his first exhibition opening Feb. 23, "Press/Process the Art of Prints," featuring artists from Rembrandt to Rauschenberg and exploring the printmaking process, Murphy is looking forward to an exhibition next fall that will include a drawing by Michelangelo. The show, USD's third collaboration with the British Museum of Art, will focus on the birth, death and resurrection of Christ. "I don't know the last time a Michelangelo drawing was displayed on the West Coast," said Murphy, adding that the show will be an "amazing" opportunity for the USD and San Diego communities to see work by a host of Old Italian masters including Andrea del Castagno and Parmigianino. This semester, Murphy also is teaching a class on Modern Art and co-teaching a seminar on Victorian-era social critic John Ruskin in USD's Humanities Center. "Like Erin before him, John brings the highest level of print scholarship to San Diego," said Director of University Galleries Derrick Cartwright. "My colleagues and I have been impressed by the breadth of his knowledge of print culture and his enthusiasm for communicating that history to students. In the short while that he has been at USD, John is already having clear impact."